Samantha Jane: 30,000 Subscriber Giveaway!!!! Thank you so so so much for 30,000 subscribers! 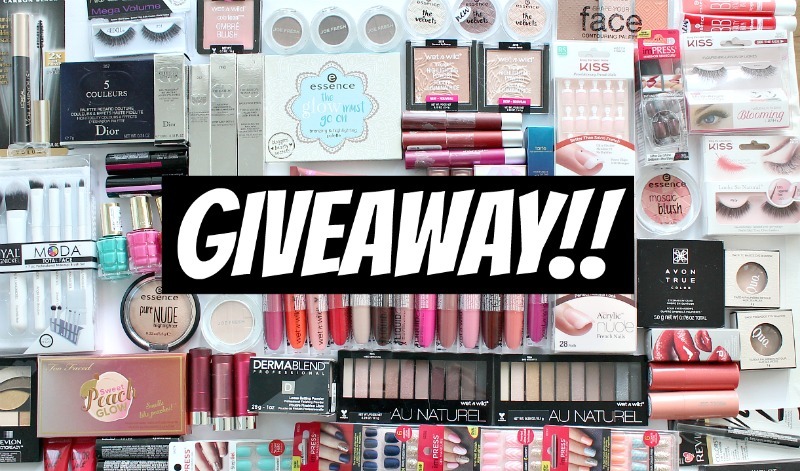 Enter below to win a HUGE box of makeup. Also up for grabs 1 of 5 haircare sets from L'Oreal for my Canadian subscribers. You go girl! My hair is wavy, thick, and dry at the ends. I can't believe what an amazing and generous contest this is!! Thank you, Samantha! I have fine hair but lots of it! Its also colour treated! I love your channel give away or not! You always respond to my comments, snap chats and Oily skin diaries and your get ready with me's are awesome! So excited for you. I've been subscribed for a long time.It's been so great to see your channel grow. Congrats!!! What a generous giveaway. Congrats on 30k. not commenting for the haircare but just want to say you're such a kind person and congrats on 30k !!!!! Congrats on 30K you deserve it! My hair is coloured and damaged! Congratulations Sam!! This is well deserved! Muah! Congratulations Sam!So proud and happy for you.Love you! Congratulations Samantha on your 30K Subscribes! You honestly deserve it! I hope the future holds more greater milestones for you!! So glad that I discovered your channel, as you always have honest and relatable opinions!! Congrats on 30K! Naturally I have between 3c and 4a hair, but I wear straight extensions. I live in TO too! Hello!I'm from London, Ontario. I have dry and old hair. LOL! Congrats! You and your channel are just amazing! I'm glad i stumbled onto your channel one late night on youtube looking for bronzers for tan skin lol! And i appreciate how you respond to us even on snapchat! Didn't think you would do that lol! Again congrats on 30K, you defiantly deserve it! I have fine hair that's dry/damaged on the ends, but gets oily at the scalp. Fun! My hair type is straight, thick and tends to get oily:) Congrats!!! Congrats! I have thin, wavy hair. I have THICKKKK, course, straight hair!! Congrats! I really like your channel. Thank you for sharing all this content. I am from Germany and it is always interesting, what you think about all the european drugstore stuff. Congrats! I can't imagine that many followers. A lot of hard work. I have normal hair. Lots of layers so lots of split ends. My hair is thick and wavy. Congratulations on 30k!! You deserve so many more!! I'm so glad that you did a Wt n Wild take-over. That's where I found you!! Congratulations that's so exciting! I love that you do Canadian makeup, it's really nice to see. My hair is pin straight and very thick. Amazing giveaway! Huge congrats from a fellow Newfie!! My hair is long, coarse and dry! My hair type is dye-fried, damaged, oily, and wavy hair. Congratulations! It's a well deserved milestone. I'm not just saying that because you happen to look like my niece. Congrats! I have thin oily and colour treated hair. Congrats :) I love your YouTube videos! I especially love that you reply to comments and that you're from Newfoundland too! Thanks so much for doing a give away. My hair is dry and frizzy. Congrats on almost 30k! I've been following you since about Halloween of 2016 and have watched your videos religiously since! I definitely feel like you deserve so many more subscribers especially because of the quality of your content. So happy to see another Canadian youtuber. My hair type is definitely dry and curly. Ringlet curls, like the ones you get from a curling wand. Also frizzy haha. Congrats on your milestone. I have fine coloured hair. congrats girl, love your videos. Congrats on your channel milestone! My hair type is fine, long and colour treated. Oh I'm so happy for you! 😀 Im really glad you popped on my recommended list.You give so much positive energy in your videos it makes me happy. I love having your vids in the background playing as I get ready for work. P.s hair has never been colored and fizzy. Congrats girl! This is such a generous giveaway. Thanks for the chance! My hair is curly and dry. What an awesome giveaway - loved your video, brought me to tears too! Hair type: blond, thick & flat? Is that even a hair type? OMG! You deserve your 30k subscribers so much, you make such good videos with good content, love them!! Just found your YouTube channel, congrats on the milestone! I have brown and blond baylage with wavy hair (on the thin/fine side). Also wanted to say I tried to enter my IG name and made a booboo on my phone and now can't fix it on the form but did follow you there too! Great giveaway! I'm so happy and proud of you. People like you deserve all the love. Congratulations Samantha! Wishing you all the best with your Channel and many more subs! You are amazing at what you do and you are kind and beautiful inside and out. :) Wishing you all the best! My hair is colour treated, I have thin hair but a lot of it. :) Hope you have a beautiful week! I would say my hair is dull and frizzy. I have wavy hair that gets frizzy from time to time! Congrats on 30k!! Been on the channel since 5k. I'm so proud 😭❤ so happy for u!! I love you!! Hi and huge congrats to you. I have 55 year old naturally curly (or what I like to call ..unruly) hair. I am always told how lucky I am to have such thick hair but I find with age it is getting very dry and unmanageable. Shoutout congrats!!! I have dry on the thinner side long hair...This would be so exciting to win. I have long, fine hair. gets oily quick in the front. You're amazing❤️ I would love to win this. Spring/Summer Picks from Beauty United! Mary Kay Clear Proof Mask Review + Giveaway!